Who invented the Atomic Bomb? The name of the person credited with inventing the Atomic Bomb is J. Robert Oppenheimer (1904 - 1967). J. Robert Oppenheimer is not only famous as the American inventor of the Atomic Bomb but also as a professor of physics and a theoretical physicist. Oppenheimer is often referred to as the "the father of the atomic bomb". When was the Atomic Bomb invented? J. Robert Oppenheimer invented the Atomic Bomb in 1945, during the WW2 (1939 - 1945) period of invention. Definition of the Atomic Bomb: The Atomic Bomb is defined as a nuclear weapon with great explosive power that results from the sudden release of energy upon the fission, or splitting, of the nucleus of such heavy elements as plutonium or uranium. A nuclear explosion results that has the power to destroy a city and kill every person and living thing in it. Fact 1: Who invented the Atomic Bomb? The Atomic Bomb was invented by J. Robert Oppenheimer in 1945 during the WW2 (1939 - 1945) era of inventions which was a startling addition to advancements made in the area of Weapons and nuclear warfare. Fact 2: Who invented the Atomic Bomb? Conventional weapons were used prior to the invention of the Atomic Bomb nuclear weapon in 1945. Nuclear weapons possess enormous destructive power from nuclear fission or combined fission and fusion reactions. Fact 3: Who invented the Atomic Bomb? At the start of WW2 scientists had discovered that a powerful explosion might be possible by splitting an atom - hence the name Atomic Bomb. The Atomic bomb is so powerful that it can destroy large cities in a single blast. Fact 4: Who invented the Atomic Bomb? The inventor of the Atomic Bomb, J. Robert Oppenheimer, was born on April 22, 1904 in New York City, New York, United States and died on February 18, 1967. J. Robert Oppenheimer led a group of scientists as the scientific director of the Manhattan Project. Fact 5: Who invented the Atomic Bomb? The Manhattan Project was established in the United States of America during WW2 starting on May 12, 1942 when President Franklin D Roosevelt signed an order creating a top secret project to develop the nuclear weapon, the Atomic Bomb. Fact 6: Who invented the Atomic Bomb? Whilst attending the University of Gottingen, J. Robert Oppenheimer published many important contributions to then newly developed quantum theory. Fact 7: Who invented the Atomic Bomb? Following his education he accepted an assistant professorship in physics at the University of California, Berkeley. theoretical physics. During this time he focussed on theoretical physics and undertook important research in astrophysics and nuclear physics. Fact 9: Who invented the Atomic Bomb? World War 2 broke out in Europe in 1939 and, although the United States of America did not become involved in the war until December 1941, efforts to develop an atomic bomb had begun at Lawrence's Radiation Laboratory at Berkeley. 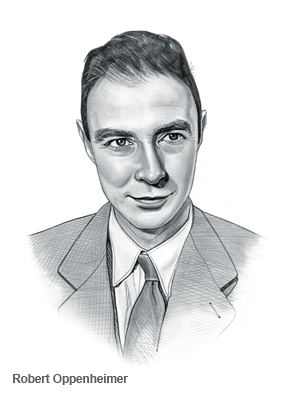 J. Robert Oppenheimer took a leading role in the study of neutron calculations. Fact 10: Who invented the Atomic Bomb? In June 1942 General Leslie Groves appointed J. Robert Oppenheimer as the scientific director of the Manhattan Project. Fact 11: Who invented the Atomic Bomb? The Manhattan Project was chiefly carried out in three secret locations at Washington, Tennessee and Los Alamos, New Mexico. The Manhattan Project employed 130,000 workers and, by the end of WW2, had cost $2.2 billion. Fact 12: Who invented the Atomic Bomb? J. Robert Oppenheimer directed the construction of the Manhattan Project laboratories at Los Alamos and was joined by the best scientists from United States, Great Britain and Canada to work on creating an atomic bomb. Fact 13: Who invented the Atomic Bomb? The joint work of the scientists at Los Alamos resulted in the first nuclear explosion at Alamagordo, New Mexico on July 16, 1945, which J. Robert Oppenheimer named "Trinity." The first atomic bomb was referred to as the 'Gadget'. The "Gadget" atomic bomb exploded with a 18,000 ton TNT equivalent and the explosion created a massive crater which measured nearly 2,400 feet across. Fact 14: Who invented the Atomic Bomb? Following the Trinity test and the first detonation of a nuclear weapon , J. Robert Oppenheimer repeated the famous quote from a Hindu scripture "Now I am become Death, the destroyer of worlds." Fact 15: Who invented the Atomic Bomb? J. Robert Oppenheimer repeated the famous quote "Now I am become Death, the destroyer of worlds." Fact 16: Who invented the Atomic Bomb? Different shapes and sizes of casings were made for the Atomic bombs developed by the Manhattan Project that led to the code names of the "Thin Man", the "Fat Man" and "Little Boy". Fact 17: Who invented the Atomic Bomb? The Manhattan Project scientists abandoned the "Thin Man" as the gun-type bomb using plutonium was found to be impractical. It was replaced by the smaller "Little Boy" bomb. Fact 19: Who invented the Atomic Bomb? The "Fat Man" atomic bomb was developed as an implosion model plutonium bomb. Fact 20: Who invented the Atomic Bomb? The delivery of the "Little Boy" Atomic Bomb and the "Fat Man" atomic bomb to Japan were made using Boeing B-29 Super-fortress bombers. The Enola Gay was the name that was painted on the Boeing B-29 Superfortress bomber that became the first aircraft to drop an atomic bomb. The aircraft was named for Enola Gay Tibbets, the mother of the pilot, Colonel Paul Tibbets. Fact 21: Who invented the Atomic Bomb? The 'Enola Gay' dropped the "Little Boy" Atomic Bomb on the city of Hiroshima, Japan on August 6, 1945. Over 60,000 people were instantly killed at Hiroshima, and another 200,000 subsequently died as a result of burn and radiation injuries. Fact 22: Who invented the Atomic Bomb? The B-29 Superfortress, nicknamed 'Bockscar', dropped the second atomic bomb, "Fat Man", at Nagasaki resulting in the deaths and injuries of more than 65,000 people and the destruction of half of the city of Nagasaki. Fact 23: Who invented the Atomic Bomb? The effects of dropping the Atomic Bombs were horrific. Deadly “Black rain”, carrying particles of uranium and plutonium, fell on Hiroshima and Nagasaki. The people received two doses of deadly radiation. One dose of radiation during the explosion and another dose of radiation from the fallout. The dead were found carbonized. Survivors suffered from radiation poisoning that destroyed vital body cells including blood and hair cells and reproductive cells. Delayed effects involved almost all tissues or organs resulting in cancer, genetic mutations and decreased fertility. Fact 24: Who invented the Atomic Bomb? At the end of WW2, J. Robert Oppenheimer was appointed Chairman of the General Advisory Committee to the Atomic Energy Commission (AEC) from 1947 to 1952. Fact 25: Who invented the Atomic Bomb? It was during this time that the Soviet Union started development of their own atomic bomb project. Then both the USSR and the USA began to developed even more powerful nuclear fusion weapons known as "hydrogen bombs". The Cold War between the two nations stirred strong U.S. anticommunist feelings. Fact 26: Who invented the Atomic Bomb? J. Robert Oppenheimer expressed strong opposition to the development of the hydrogen bomb. Oppenheimer was accused of having communist sympathies, and his security clearance was taken away by the Atomic Energy Commission (AEC). Fact 27: Who invented the Atomic Bomb? J. Robert Oppenheimer served as Director of Princeton's Institute for Advanced Study overseeing research on quantum and relativistic physics in the School of Natural Sciences. Fact 28: Who invented the Atomic Bomb? In 1963, United States President Lyndon B. Johnson attempted to redress the injustices suffered by J. Robert Oppenheimer by honoring him with the Atomic Energy Commission's highly prestigious Enrico Fermi Award. Fact 29: Who invented the Atomic Bomb? In 1966 J. Robert Oppenheimer Oppenheimer retired from Princeton's Institute for Advanced Study. He died a year later of throat cancer on February 18, 1967.